The department of the Marine Corps that handles the public affairs business of the USMC is the Office of U.S. Marine Corps Communications. USMC Public Affairs goals are to build understanding, credibility, and trust with local and international people and media organizations. The Office of USMC communications plans, coordinates, and implements communication strategies to build these needed relationships. The Office of U.S. Marine Corps Communication is the liaison between the entire Marine Corps and the public. It accomplishes its mission by providing a steady flow of information that is generated through all types of media: Video, Broadcast / Cable Television, Social Media, Website Articles, Printed Periodicals and wireless applications. The Office of USMC Communications has evolved with technology to a 21st Century communication multi-media capability. The USMC Public Affairs Officer is a commissioned officer in the Marine Corps whose sole purpose is to disseminate Marine Corps information to the public. Part community relations with the civilian media and community and informational liaison with local and national news media sources, the USMC Public Affairs Officer is the face of the Marine Corps to the local community outside the base. Depending upon the command attached to, the Public Affairs Officer may also have responsibilities on a national and international level sharing information with a variety of media sources. Public affairs officers advise the Marine Corps and combatant commanders and their staff on public affairs capabilities, and public affairs matters that include public information, community relations, and internal information. Public affairs officers perform duties In international and/or joint public affairs. In garrison, public affairs officers manage the activities of a public affairs office. The enlisted members working in the Public Affairs Department are skilled in all forms of media from video, television, radio, internet, newspaper, and magazines. 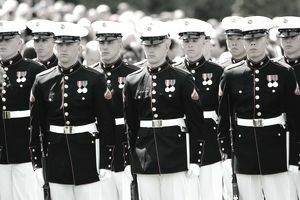 There are cameramen, videographers, journalists, web designers, and even TV anchor Marines who help prepare the information for release through the variety of mechanisms available. These multi-media skilled enlisted members are capable of making feature articles for posting online, in print media, as well as through video. In fact, Marines.mil, Marines TV, and Marine Social Media are some of the ways the public affairs departments around the Marine Corps get the word to the families, local citizens, and local and international media sources. Public Affairs Marines must be trained in and equipped with the latest technological media advances and postured to serve the Force Commanders as they achieve their mission of communicating with the American people and the World about what is happening on the battlefield as well as aboard local Marine Corps bases. (1) Certifying authority for 4302 primary MOS is the CMC (PA). (3) Officers of other primary MOSs, who are filling a 4302 billet, meet the performance standards in Marine Corps Order (MCO) 1510.62, have completed Public Affairs Officer Qualification Course-DL-Phase 2 at Defense Information School (DINFOS), Fort Meade, Maryland, and who have demonstrated a satisfactory level of public affairs experience, may apply for MOS 4302 as an additional MOS only. (4) Public affairs officers are able to compete for MOS 4305 (Mass Communication Specialist) through the Special Education Program Board process, which enables public affairs officers to attain a Master of Communications degree at San Diego State University. Public Affairs Officer Qualification Course (PAOQC) at Defense Information School (DINFOS), Ft. Meade, MD -Entry Level MOS course. The Public Affairs officer Qualification Course-DL-Phase 2 at DINFOS, Ft. Meade, MD. Joint Senior P:.ililic Affairs Officer Course (JSPAC) at DINFOS, Ft Meade, MD-Senior Level MOS course. DoD Joint Course in Communication at the University of Oklahoma, Norman, OK-Interim Level MOS course. (1) Public Relations Representative 165.067-010.